Fairborn senior Kayleigh Finlayson tips the ball over Xenia senior middle hitter Kristina White, during Thursday’s Oct. 12 girls high school volleyball match at Xenia High. 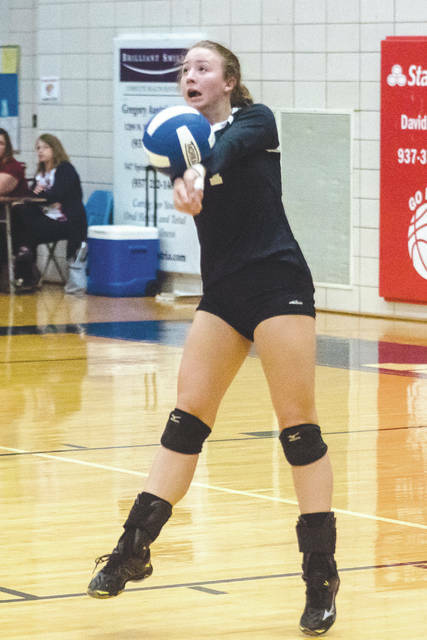 Finlayson recorded a match-best 11 kills to lead Fairborn to a straight-set win and its first-ever GWOC divisional title. Fairborn’s front-line players Eryn Thomas (24) and Jessica Black (10) leap up to deflect a shot by Xenia’s Saphron Cummins (3), in an Oct. 12 girls high school volleyball match at Xenia High School. Xenia’s Heidi Alex executes a successful bump return of serve during Thursday’s Oct. 12 Greater Western Ohio Conference, American South divisional home match with Fairborn. 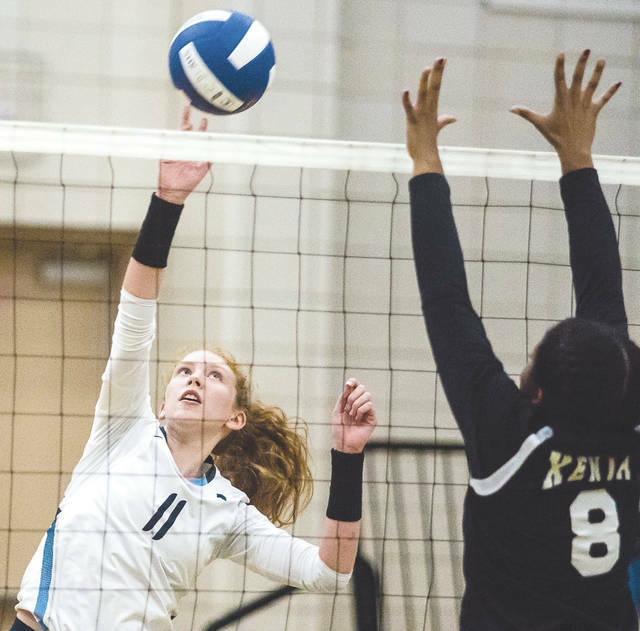 XENIA — Visiting Fairborn defeated Xenia in straight sets to lay claim to the school’s first-ever Greater Western Ohio Conference, American South girls high school volleyball title, Oct. 13 at Xenia High. Heading into the team’s final match of the regular season, Fairborn (now 9-13 overall, 8-6 in the division) held a one-game lead in the South division standings over Stebbins. The Skyhawks needed Thursday’s win to claim the division title outright. Fairborn won by scores of 25-11, 25-9 and 25-20. 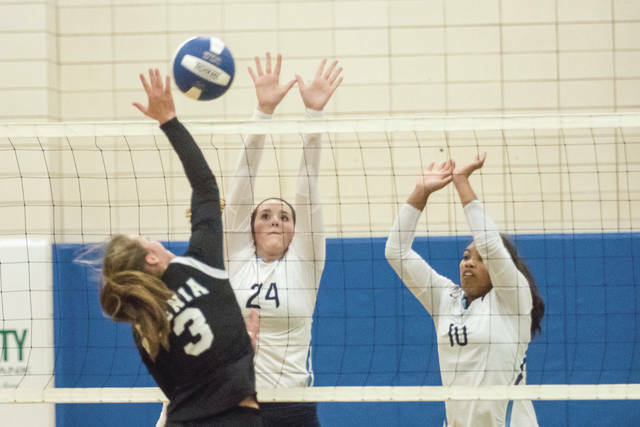 They swept the home-and-home series with Xenia as well, as the Skyhawks won in straight sets back on Sept. 5 in Fairborn, too. Xenia finished the regular season with a 5-17 overall mark, 2-12 in the GWOC South. “We wanted this to ourselves. Stebbins can’t share this with us now, so it’s a good feeling for these girls,” said Fairborn coach Tiffany Smith. “The first two sets were probably some of the best volleyball we’ve played all season. That third set, we started to get a little complacent, maybe a little bit over confident. But those first two sets were them at their best. Smith said a lineup change, where she switched an outside hitter to the libero position and added another outside hitter to the lineup, has the team playing very well right now. Skyhawks senior Kayleigh Finlayson led everybody with 11 kills. Some of her early points were from push sets that would fall into uncovered spots in the Xenia backcourt. Elena North led everybody in service aces with five. Junior hitter Jessica Black finished with three blocks and five kills, but had a scary moment early in the second set. Black appeared to slip on some moisture on the court as Fairborn led, 9-1. She quickly grabbed her knee upon falling to the floor, but was able to walk to the bench on her own. Black returned to the match with Fairborn out in front 14-5, still in the second set. Black closed out the match by dunking an errant Xenia over-set ball for the final point. Xenia coach Jessica Threats had said early on that the 2017 season would be a time where a bunch of new faces would need to work on figuring out how to play together as a unit. Injuries and lineup changes have hampered that learning process. In the final set against Fairborn, Xenia had four instances where two or more Bucs simultaneously called for the ball and nobody hit it. On one point, five players surrounded the ball in a star pattern, only to watch as the ball fell between them. Heidi Alex led Xenia with two kills and a block. Fairborn is the No. 14 seed in the upcoming Division I sectional volleyball postseason tournament. They’ll take on No. 15 Springfield for their first match at 6 p.m. Tuesday Oct. 17 at Butler High School in Vandalia. Xenia is the tournament’s 18th seed. The Buccaneers open up against No. 5 Lebanon at 7:30 p.m. Thursday, Oct. 19 at Centerville High School. Contact John B0mbatch at 937-372-4444, Ext. 2123.